If you are someone who uses Paypal’s peer-to-peer transaction app, Venmo, I’m sure you know how difficult it is to add contacts to the app. To add a friend, users have to search their friends on the app using a phone number, a name, or a username. This is difficult especially in cases of common names or usernames that are difficult to type. Users can also send people an SMS invite via the Venmo website. Now, thanks to the app’s latest addition on Android and iOS, users can completely skip the old process of adding friends. 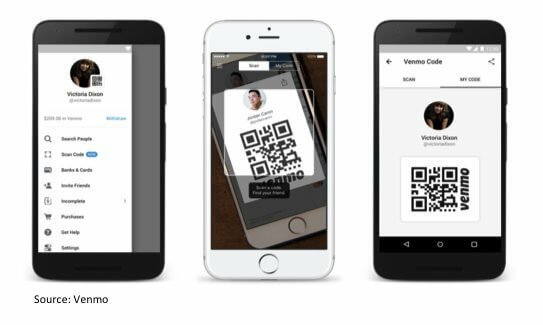 The Venmo app now uses QR Codes to help people add friends to their list. Each user has a small QR Code displayed next to their picture in the app. Users will need to select the ‘Scan Code’ option from the menu to scan the QR Code and add their friend to their Venmo list. Scanning the QR Code also allows users to transfer money to the contact. This isn’t the first time that an app has used QR Codes to make the process of adding friends easier. Popular instant image sharing app, Snapchat uses Snap Codes to help users add friends. Similarly, instant messaging apps like WeChat and WhatsaApp also use QR Codes. Many payment apps across the globe such as Paypal, Target, Walmart in the US, WeChat and Alipay in China, BHIM, Paytm and Mobikwik in India use QR Codes for cashless transactions. What are your views on the Venmo QR Code? Share your thoughts in the comments section below.